The pillory was a device made of a wooden or metal framework erected on a post, with holes for securing the head and hands, formerly used for punishment by public humiliation and often further physical abuse, sometimes lethal.The pillory is related to the stocks. The word is documented in English since 1274 (attested in Anglo-Latin from c.1189), and stems from Old French pellori (1168; modern French pilori, see below), itself from Medieval Latin pilloria, of uncertain origin, perhaps a diminutive of Latin pila "pillar, stone barrier." Rather like the lesser punishment called the stocks, the pillory consisted of hinged wooden boards that formed holes through which the head and/or various limbs were inserted; then the boards were locked together to secure the captive. Pillories were set up to hold petty criminals in marketplaces, crossroads, and other public places. They were often placed on platforms to increase public visibility of the punished offender. (See photo, right.) Often a placard detailing the crime was placed nearby; these punishments generally lasted only a few hours. Time in the pillory was more dangerous than in the stocks, as the pillory forced the offender to remain standing and exposed. A criminal in the stocks would expect to be abused but his or her life was not targeted. A prisoner in the pillory was presumed to have committed a more serious crime and, accordingly, usually triggered a more aggressive reaction from the crowd. As part of the punishment, crowds would throw garbage and other objects at the captive pilloried offender. With hands trapped, he or she could not avoid thrown objects—either mostly harmless items like rotten food, or injurious ones such as heavy stones, where blinding, permanent maiming, or death could be the consequence. Sometimes a criminal's ears would be nailed to the pillory so that any movement of the head to avoid thrown objects would cause further injury. The criminal could also be sentenced to further punishments while in the pillory: humiliation by shaving of some or all hair or regular corporal punishment(s), notably flagellation (the pillory serving as the "whipping post"), birching, caning or even permanent mutilation such as branding or having an ear cut off, as in the case of John Bastwick. The pillory at Charing Cross in London, circa 1808. After 1816, use of the pillory was restricted in England to punishment for perjury or subornation. The pillory was formally abolished as a form of punishment in England and Wales in 1837, but the stocks remained in use, albeit extremely infrequently, until 1872. The poteau (another French term) was a simple post, often with a board around only the neck, and was synonymous with the mode of punishment. This was the same as the schandpaal ("shamepole") in Dutch. The carcan, an iron ring around the neck to tie a prisoner to such a post, was the name of a similar punishment that was abolished in 1832. A criminal convicted to serve time in a prison or galleys would, prior to his incarceration, be attached for two to six hours (depending on whether he was convicted to prison or the galleys) to the carcan, with his name, crime and sentence written on a board over his head. A permanent small tower, the upper floor of which had a ring made of wood or iron with holes for the victim's head and arms, which was often on a turntable to expose the condemned to all parts of the crowd. 18th century illustration of perjurer John Waller pilloried and pelted to death in London, 1732. Like other permanent apparatus for physical punishment, the pillory was often placed prominently and constructed more elaborately than necessary. It served as a symbol of the power of the judicial authorities, and its continual presence was seen as a deterrent, like permanent gallows for authorities endowed with high justice. In Portugal several pelourinhos, typically on the main square and/or in front of a major church or palace, are now counted among the major local monuments, several clearly bearing the emblems of a king or queen. The same is true of its former colonies, notably in Brazil (in its former capital, Salvador , the whole old quarter is known as Pelourinho) and Africa (e.g. Cape Verde's old capital, Cidade Velha ), always as symbols of royal power. In Spain it was called picota. 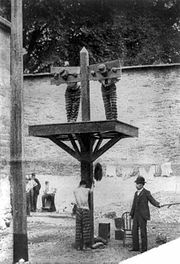 The pillory was also in common use in other western countries and colonies, and similar devices were used in other, non-Western cultures. According to one source, the pillory was abolished as a form of punishment in the United States in 1839, but this cannot be entirely true because it was clearly in use in Delaware more recently than that. There even was a variant (rather of the stocks type, in fact), called barrel pillory or Spanish mantle, to punish drunks, which is reported in England and among its troops. It fitted over the entire body, with the head sticking out from a hole in the top. The criminal is put in either an enclosed barrel, forcing him to kneel in his own filth, or an open barrel, also known as barrel shirt or drunkards collar after the punishable crime, leaving him to roam about town or military camp and be ridiculed and scorned. (Note that the expression over a barrel refers to a timber barrel being used as an alternative to the whipping post, but which the punishee has to bend over, like a punishment horse, so physical pain is more prominent than public humiliation). Although a pillory, by its physical nature, was a perfect choice to double as a whipping post to tie a criminal down for public flagellation (as used to be the case in many German sentences to staupenschlag), the two as such are separate punishments: the pillory is a sentence to public humiliation, whipping an essentially painful corporal punishment that could be administered anywhere, (semi-)publicly or not, often in prison; if a pole or more elaborate construction is erected, temporary or permanent, often on a scaffolding, for lashings, as in a few southern US prisons until the 1960s, the correct term is whipping post - however, sometimes a construction combines the two: display at the upper storey above a pole used to tie the victims to, as illustrated in the picture (right) of the installation at New Castle County Jail, Delaware. When permanently present in sight of prisoners, it can act as a deterrent for bad behaviour, especially when each prisoner had been subjected to a "welcome beating" at arrival, as in 18th century Waldheim in Saxony (12, 18 or 24 whip lashes on the bare posterior tied to a pole in the castle courtyard, or by birch rod over the "bock", a bench in the corner). Still a different penal use of such constructions is to tie the criminal down, possibly after a beating, to expose him for a long time to the elements, usually without food and drink, even to the point of starvation. While the pillory has left common use, the image remains preserved in the figurative use, which has become the dominant one, of the verb "to pillory" (attested in English since 1600), meaning 'to expose to public ridicule, scorn and abuse', or more generally to humiliate before witnesses, e.g. in class. Corresponding expressions exist in other languages, e.g., clouer au pilori "to nail to the pillory" in French, or "mettere alla gogna" in Italian, which in Dutch is aan de schandpaal nagelen, placing even greater emphasis on the predominantly humiliating character as the Dutch word for pillory, schandpaal, literally meaning 'pole of shame'.